For the first nine months of 2018, the state’s biopharma cluster sizzled. Biotech stocks reached record highs. When Dr. Barbara Weber attends the annual J.P. Morgan Healthcare Conference that starts Monday in San Francisco, the Cambridge biotech CEO expects a far more apprehensive mood than the one she encountered a year ago at the drug industry’s largest event for investors. The stock market’s sharp decline in the last quarter of 2018 has many Americans worried. But the tumble was particularly brutal for the state’s high-flying biotech sector, which relies on investors’ appetites for risky ventures that take years to yield new medicines — and often never do. A year ago, the pharmaceutical industry was flush with cash. President Trump had just signed a tax cut that enabled drug makers to bring billions of dollars of overseas cash back home. And Massachusetts venture capitalists had stockpiled hundreds of millions of dollars to create new companies. For the first nine months of 2018, the state’s biopharma cluster sizzled. Biotech stocks reached record highs. Startup companies went public at a blistering pace; 17 Massachusetts firms raised $2.4 billion by year’s end, including Cambridge-based Moderna Therapeutics, which set an industry record with a haul of $604 million, despite having no products on the market. And firms trumpeted advances in developing drugs for deadly diseases from cystic fibrosis to devastating forms of leukemia. Then came the stock market meltdown. The S&P 500 index ended the year down 6.2 percent. The plunge was even steeper for biotech stocks; the Nasdaq Biotechnology Index fell 9.3 percent. Friday’s jobs report led to a good day on Wall Street, but now it’s a new week, and recent history has shown that such rallies can be short-lived. More important, many biotechs that went public amid giddy expectations remain underwater. CEOs worry that investment capital will dry up in 2019, making it harder to discover and develop new medicines. The newly Democratic House and the Trump administration are clamoring along with patients for companies to lower dizzying drug prices. And some industry experts say much of the exuberance about risky investments had been unrealistic. How it all plays out remains to be seen, of course. But the market turmoil will certainly color almost every discussion at the 37th annual J.P. Morgan conference. The event draws thousands of name-tag-wearing executives, analysts and investors to the Westin St. Francis Hotel in San Francisco’s Union Square. Over the years, JPM, as many call it, has marked the unofficial start of the year for the drug-making industry. CEOs make half-hour pitches to investors and analysts in crowded conference rooms and deliver spiels to journalists in hotel rooms. Executives also negotiate business deals in the hallways and network over expensive food and drinks at upscale restaurants. There are plenty of communication firms helping the executives polish their messages. One San Francisco company, W2O Group, will have 40 staffers at the event, many of them situated at the Cartwright Hotel, said Lauren Barbiero, an associate director of the firm. 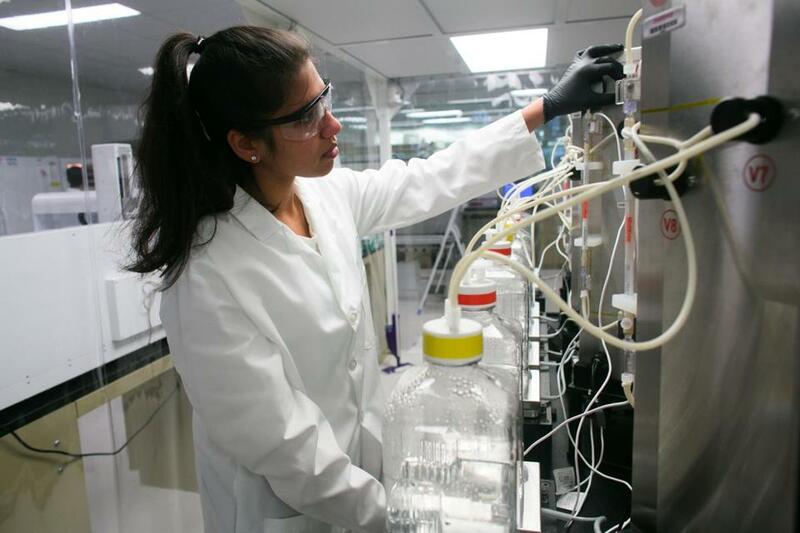 Several drug company executives in Massachusetts — which consistently ranks at or the near the top of states with the most biotech jobs — say the science undergirding drug development remains as strong as ever, despite the plunging stock prices. Ironwood plans to split into two publicly traded firms in the first half of the year, one of which will focus on rare diseases. Hecht will leave Ironwood to run that company. Among the Massachusetts executives expected to talk about significant progress in drug development at the Westin is Jeffrey Leiden, the CEO of Boston-based Vertex Pharmaceuticals. Vertex has introduced three drugs since 2012 that, for the first time, treat the underlying cause of cystic fibrosis in roughly half of the 30,000 patients with the rare genetic disease, which attacks the lungs and other organs. The annual price tags of the drugs range from $272,000 to $311,000 and have drawn sharp criticism. One of two new experimental medicines from Vertex for the disease is likely to be approved in about a year, based on encouraging late-stage clinical results. That would help the company reach a longstanding goal of making cystic fibrosis treatable for 90 percent of patients. John Maraganore, the chief executive of Alnylam Pharmaceuticals, also plans to trumpet his company’s progress. In August, the Cambridge biotech won Food and Drug Administration approval for a medicine, Onpattro, to treat a rare disease called hereditary transthyretin-mediated amyloidosis, or hATTR. It was the first-ever approval of a drug based on a Nobel-prize-winning technique known as RNA interference, which silences disease-causing genes. Onpattro, whose list price is about $450,000, had an underwhelming first quarter of sales, but executives in November encouraged investors to withhold judgment. There also have been major setbacks in the industry. An FDA advisory panel in November skewered an opioid-based depression drug that Alkermes had developed, setting it up for almost certain rejection by the agency later this month. But Alkermes, which is headquartered in Ireland but has its R&D operations in Waltham, got good news a few weeks later: The company said that patients who were treated with another experimental drug that it had developed reported significantly less weight gain, compared to those who took the most commonly prescribed antipsychotic currently in use. If the mood at the conference is likely to be more apprehensive this year, some other things have not changed. As in past years, the days leading up to JPM have witnessed a flurry of announcements by drug makers and venture capitalists, some dramatic, others less so. Last week, Bristol-Myers Squibb and Celgene announced a $74 billion merger in one of the largest pharmaceutical industry deals ever. Atlas Venture, of Cambridge, announced that it had raised $250 million to fund more mature biotechs. And Biogen, another Cambridge company, announced it was collaborating with C4 Therapeutics of Watertown and Skyhawk Therapeutics of Waltham on separate programs involving potential treatments for neurological diseases. The terms disclosed add up to $489 million between the two agreements. Jonathan Saltzman can be reached at jsaltzman@globe.com.